On October 10 and 11, the first game of the 19th Ryuoh-sen between Ryuoh Watanabe and Challenger Kisei Sato was held at Hotel Nikko in San Francisco, USA. 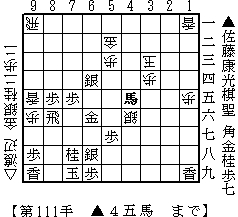 Ryuoh-sen is four-wins match and its prize money is the biggest in the professional shogi world. The winner of the match will take 32 million yen. P-9g+ N*2e K-3b +Bx3d S*8h Rx8h +Px8h Kx8h Lx9h+ Lx9h Rx9h+ Kx9h L*9a K-8g R*9g K-7f R-9f+ L*8f(Now Gote's pieces in hand is running out and Gote's King is in brinkmate). You can replay the full game on the virtual board(Java capable browser needed). Ryuo-sen is sponsored by Yomiuri Shimbun. The next game will be held on October 31 and November 1. Ryuoh Watanabe will make a first move.